It is within the power of the Federal and South Australian governments to require, as a condition of consent to the BHP Billiton proposal, that at the time the desalination plant is commissioned, the company will surrender any and whatever licence it has to extract water from the Great Artesian Basin …. It is our further submission that this is not an economic issue, it is not even an environmental issue, it is about the ethics of any company continuing to assert its current right to a public resource when that company has the financial capacity to secure the same resource from its own private reserves. …. On the dry Australian continent groundwater is the only consistently reliable source of water; it is thus an extremely valuable resource. 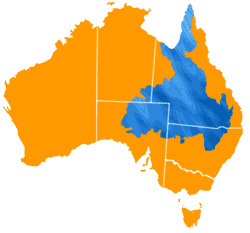 The Great Artesian Basin (GAB) is the largest of those groundwater resources. The total value of production supported by GAB water is estimated at $3.5 billion per annum. Without that groundwater there would be little to no economic activity and in fact little opportunity for life in much of regional Australia. Currently, many groundwater resources are over-allocated leading to declining water tables and water quality. Federal and State governments as well as private business are investing large amounts of money to rectify this problem. An example is the $140 million GABSI program to save GAB water. Mining, including coal seam gas mining, is one of the major pressures on groundwater reserves; given the private nature of mining the public groundwater needs of any and every mine should be assessed carefully against the value of the public groundwater resource. BHP Billiton is proposing to construct one of the largest open-cut mines in the world at Olympic Dam in South Australia. The proposal is now before the Federal, South Australian and Northern Territory Governments. Included in one of the largest infrastructure projects ever undertaken in Australia is a new airport, a new town for a construction workforce of 10,000, a new shipping terminal in Darwin, more than 100km of new mainline railway, the second largest desalination plant in Australia, and many other massive infrastructure investments. The new mine will consume more than eight times the volume of water that is currently extracted by BHP Billiton from the GAB for the existing Olympic Dam underground mine; thus the need for a very large desalination plant. That desalination plant creates a unique opportunity for the GAB. It is a plant which the company intends to construct with a surplus capacity that is almost twice the water volume that the existing underground mine takes from the GAB. BHP Billiton offers no commercial or other explanation for the surplus capacity; in fact the company acknowledges that it has no actual identifiable use for the surplus water. In the published BHP Billiton proposal the company states an intention to continue to extract water from the GAB as it is entitled to do under a water licence issued 25 years ago by the South Australian Government – a licence which will not expire until 2036. BHP Billiton has previously rejected our proposal that it replace the GAB extraction with water from the desalination plant once the plant is commissioned. The massive desalination plant surplus has deprived the company of any ability to assert a `need’ for the GAB water; in response to our proposal BHP Billiton asserts only that current extraction from the GAB is sustainable and that such extraction is subject to strict monitoring requirements. The company does also suggest that capital invested in those GAB bores which currently supply Olympic Dam will be wasted if the bores were to become redundant. What the company does not state is that the miniscule capital cost of the two relevant GAB bores, measured at least against the previously referred to massive new infrastructure associated with the mine expansion, was invested between 15 and 25 years ago. Any capital invested in the bores will have been well and truly written down, or written off, by the time the new desalination plant is commissioned. It is within the power of the Federal and South Australian governments to require, as a condition of consent to the BHP Billiton proposal, that at the time the desalination plant is commissioned, the company will surrender any and whatever licence it has to extract water from the GAB. Such a condition would result in a return of up to 15 GL/yr of water to the GAB, or in excess of 300 GL over the remaining life of the license. Those figures would represent the largest single return of water to the GAB that has ever been achieved, and it would be a return achieved at no cost to the general taxpayer. It is our submission that, as the largest single extractor of water from the GAB in South Australia, BHP Billiton has created its own ethical obligation to the future of the GAB consequent upon the construction of its desalination plant; it is not appropriate for the company to seek to avoid that obligation by reliance on a water licence that was issued 25 years before the desalination plant proposal. It is our further submission that this is not an economic issue, it is not even an environmental issue, it is about the ethics of any company continuing to assert its current right to a public resource when that company has the financial capacity to secure the same resource from its own private reserves. Ongoing demand on the public resource in such a circumstance could only ever be based on `need’; BHP Billiton cannot establish any such need. It is our final submission that the Federal and South Australian governments should act in the best achievable long-term interests of the GAB and make it a requirement that if BHP Billiton does wish to proceed with its proposal for Olympic Dam then it will be a condition of such consent that the company, at or about the time of commissioning the desalination plant, will surrender any and whatever licence or other right the company has to GAB water.